In honor of National Donut Day- we are excited to bring you a GREAT GIVEAWAY- Dunkin’ Donuts GC!! What is your favorite kind of donut? Come on who doesn’t love a donut now and then and what better time to indulge just once by enjoying a donut for National Donut Day. You might even be able to score a free donut somewhere! On National Donut Day, purveyors around the country hand out freebies to all customers. The rules at each donut establishment are different, with some (but not all) requiring some purchase before any free pastries trade hands. 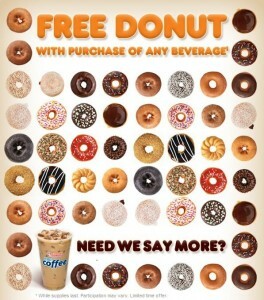 At Dunkin’, you get a FREE Donut with purchase of any beverage! Be sure to take advantage of that TODAY only! 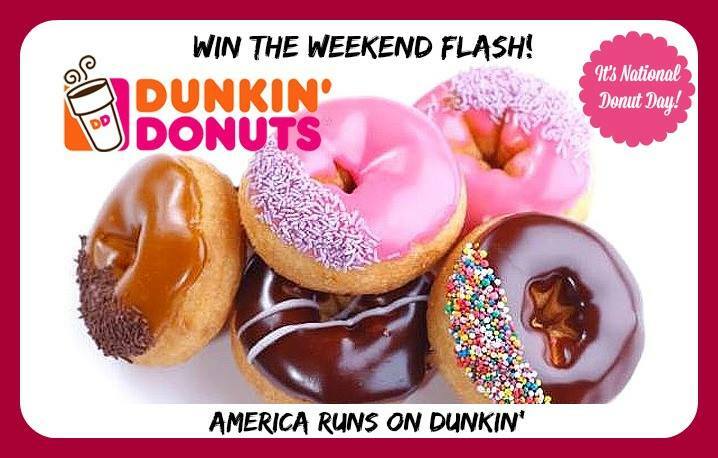 It’s super easy to win this Dunkin’ Donuts GC! Just enter on the easy rafflecopter below. Be sure to complete the mandatory entry! AND come back daily for more chances to win! « Mama says give yourself a Break! I have never had dunkin donuts before! My favorite Dunkin Donut beverage and donut is Dunkin Donut Regular Coffee and French Curler Donut. The Boston creme donut is my favorite. I like raspberry filled glazed donuts. i like the boston creme donut. I am definitely a traditional girl; I love a HOT glazed donut and a nice cup of coffee! Yum! Filled long john and coffee. I still love the original Dunkin Donut best. I love their coffee (black) and the chocolate munchkins donuts. Yum. Glazed donut with Carmel Latte. Boston cream or the apple fritters are awesome. Put some coffee with that and I am good to go. My favorite is chocolate glazed…WITH sprinkles. Because… I’m like a 4 year old. Fresh hot DD coffee and a warm French crueller and/or powdered sugar cake and/or plain cake donut…..yummmm…. I’m crazy about the lemon filled donuts, but I have to call ahead and order, these are not made regularly in Malone NY. I love the apple pie donut they have. I love the strawberry frosted !!! My favorite donut is the toasted coconut! I like the Blueberry Cake donuts and chocolate cake donuts. So good! I love the Iced Coffees! So many flavors! Um? I don’t have a fave? I don’t go here a lot since the one near me has a janky parking lot. Boston creme and apple filled are my favorites. Blueberry Cake donuts are my must haves each time I visit. Chocolate covered cream filled!And their coffee is awesome! My favorite is the maple bar….yum. A glazed donut is my favorite. My favorite is a glazed donut. I love the long Carmel and cream filled ones! When I was a kid, my mom took us to Dunkin Donuts after church on Sundays. I always got a powdered donut without fail. I love many donuts now but my favorite at Dunkin is still the powdered donut! Apple filled are my favorite! I like their iced coffee and the plain doughnut is my favorite! I love the Blueberry cake donuts and vanilla bean coolattas, I definitely going to go and get some today! My favorite donut at DD is the cocolate covered bavarian creme. So yummy. Regular coffee and a sour cream donut. I like regular coffee with cream and sugar. It’s the best! I love coffee! I have not actually been to Dunkin Donuts, so I have no idea what in particular I would like. I love blueberry cake donuts. My favorite donut is the blueberry cake donut. I love the Vanilla Bean Coolata. I love the chocolate caramel donut & their coffees! What is your favorite drink or donut at Dunkin’ Donuts? I love, Love, LOVE the bismark donut!!!! We really dig their Iced Coffee! I love the plain glazed donuts. I love chocolate glaze donuts! I love their coffee. Hubby and I drink it everyday. I’ve never been to dunkin donuts. Sadly, we don’t have one in our area. I do love their coffee! I make it at home all the time. I love Dunkin Donuts Long Johns! They are awesome! I love the good ole fashioned glazed donut! 🙂 YUMMY! I love the Boston Cream! My favorite donut at Dunkin’ Donuts is the French Cruller. This might be a shocker, but I have not ever had Dunkin Donuts yet! I love Krispy Kreme, and we just recently got a DD near us, so it would be a great time to give it a try! I like the glazed donuts with chocolate frosting. I like the maple donuts. I like the lemon filling donuts with the outside powered. Longjohns with Caramel icing is amazing. Or just a classic glazed yeast doughnut. I like the regular coffee and Chocolate cream filled donuts, they don’t make them as much. My favorite donut at DD is chocolate covered with white milk! My favorite Donut is the Boston Cream. Glazed Doughnut holes is a favorite…. I so enjoy there hazelnut iced coffee with a glazed donut :)YUM!!! med coffee and a bacon, egg and cheese gotta have the bacon lol. Boston Creme Donut and filled munchkins!! I love the chocolate long johns or chocolate frosted cake donuts! I like chocolate cake donuts with chocolate icing. I like the blueberry donuts. My favorite donut is a chocolate cream one, because it’s so delicious! Thank you for the giveaway!! Love their French drillers and love love love their regular hot coffee!!!! My favorite donut from Dunkin Donuts is an old fashioned. My coffee is a medium raspberry with eight and eight. In the winter I drink with hot coffee and when it gets warmer I change to iced coffee. They know me so well at my local DD that I don’t even have to order they get it ready for me when they see ne. I love the Bavarian Creme donuts. I love the Toasted coconut donut and the hazelnut latte. I really like the vanilla long johns. My favorite drink is a Caramel ice coffee with extra cream, extra sugar, liquid sugar, and barely any ice (to much ice waters it down) light and sweet. I drink one (or two) every day. My favorite donut at Dunkin Donuts is the regular glazed with a cup of regular coffee. I love, love, love a chocolate cream donut. OMG! I now want one, really badly!